Parys Lodge is a delightfully unique and stylish lodge, perfect for couples or small families looking for a rural retreat in this beautiful area. Secluded within the grounds of the owners’ home, the lodge has been excellently designed to provide state of the art accommodation with all the romance of a rustic log cabin retreat. The lodge is comprised of two bedrooms. One double with an en suite bathroom on the lower ground floor, and one twin. There is also a separate shower room and WC. The open plan living space is wonderfully cosy, and has a traditional wood burner that is great for curling up in front of on chillier evenings. A TV and DVD player make sure that there is plenty of entertainment available no matter what the weather decides to do. Meanwhile, outside there is a private, sheltered decked area, which is a truly idyllic spot for enjoying a leisurely coffee or al fresco dinner, basking in the tranquil surroundings. General amenities include: an electric oven and hob, a microwave, fridge and dishwasher. There is also a separate utility room with a washing machine and dryer. 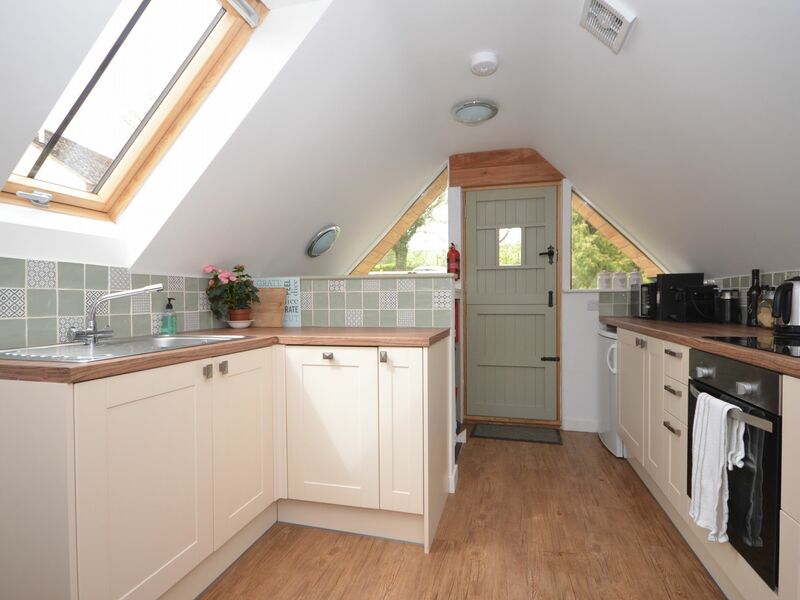 Bed linen, towels, electricity, central heating, Wi-Fi and the first basket of logs for the wood burner are all included in the rent, and there is secure parking for one car. Two, well-behaved, dogs are welcome, charged – per dog – at £20 for up to seven nights, £40 for up to 14 nights, and an additional £20 for every week/part week thereafter. The nearest shop is just 1.5 miles away, and there is a pub within easy walking distance. This beautiful region of England is rich in history and lovely rural activities and sights to discover. The incredibly varied landscape makes the whole area a haven for walking enthusiasts. There are plenty of picturesque walking trails right on the doorstep, or rolling Cotswolds hills to climb and majestic views to admire. Wychavon Way is particularly great, and provides lots of interesting features and sites of interest; including charming Broadway, with its honey coloured Cottages, quaint boutiques, antique shops, cafes and excellent restaurants. More adrenaline hungry guests will love Croft Farm Waterpark, which is only five miles from the property and offers an array of watersports, such as canoeing and windsurfing, as well as its own beach. For a livelier day out, head to the bustling city of Leicester, with its impressive architecture, theatres, shops and buzzing nightlife. This spectacular rural region makes for a wonderfully exciting countryside holiday, away from the hustle and bustle of everyday life. And Parys Lodge is a welcoming, idyllic base from which to discover this stunning area.